1988 held at Bloomington, Minnesota. Ed Ghostley’s Spooks went undefeated winning 5 straight games. They had a tough road to the championship winning they won over AES of Cincinnati 3-1 in 8 innings, they trailed Phenix of Georgia 8-0 and came back to win 9-8, They then beat the Pro Mac of California 4-3. This brought them to the winners bracket final against UPI. UPI had allowed just 7 runs in their 5 wins. But the Spooks won 5-2. UPI then had to face defending champs Key Ford Mustangs in the semi final and beat them 10-7. The Mustangs had lost to Cannan’s Illusions in the second round and won 8 games in 40 hours. UPI now advanced to the title game and another shot at the Spooks. The championship game was no contest, Spooks jumped out to a 5-0 lead in the first inning. The Spooks slapped out 17 hits winning 11-4. They were led by Tournament MVP Linda Polley, who went 3 for 4 with 3 RBIs and 3 Runs scored. UPI’s Jenni Harp Oliver had a monster tournament as she went 20-30 (,667 Average) and drove in 14 runs. 1988 held at Paulson Softball Complex in Savannah, Georgia on September 4-6. It wasn’t a case of too much power. It was just a case of too many hits. In the early morning hours of Tuesday, September 6, Smith Transport used a 26 hit attack to take a 19-10 win over Vernon’s of Jacksonville, FL, in the final game of the ASA Class A Men’s Slow Pitch National Championship at the Paulson Softball Complex. That victory ended a three-day, rain-plagued tournament. 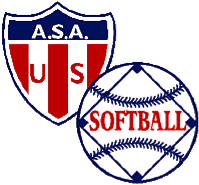 It was the first time the team had won an ASA national title. Steele’s finally broke the USSSA jinx and won their first World Series. They didn’t waste no time this year. In the final, they scored 10 runs in the first inning and never looked back. The final score was 31-12. Steele’s pitcher Rick Weiterman, considered one of the best pure hitters of all time was the emotional leader all weekend for Steele’s. They wanted no repeat of last year’s “Waterloo” disaster. The Men of Steele’s hit 15 homers in the game. Steele’s was led by Ken Loeri (5-5 with 4 HRs and 8 RBIs) and Craig Elliott was 4-5 with 3 Homers. Weiterman continued his hot hitting, saving his best for when it counted as he was 4-5 to help his own cause. Kirk’s/Ritch’s gained the finals by upsetting powerful Howard’s/Western Steer in the loser’s bracket final. Howard’s lost their very first game of the tournament 19-15 to Apollo/Lower East Side. They went on a loser’s bracket run. Rick Scherr led the surge with an 18-20 run and 12 HRs. Howard’s scored more runs than anybody in the tournament and they were eliminated in the loser’s bracket final 10-3 by Kirk’s/Ritch’s. Kirk’s/Ritch’s Pitcher Andy Cook held Howard’s to just 8 hits and gave up no home runs. Cook was 4-4 with 5 RBIs in the game also. Sadly, this would turn out to be the very last time Howard’s/Western Steer would play in the World Series as Sponsor Richard Howard decided not to sponsor the team in 1989. It was the end of one of the greatest Slow Pitch teams in softball history. With the help of some explosive bats, Howard’s went undefeated in this event, going 4-0. They defeated Steele’s in the Championship game 14-7. Rick Wheeler hit 3 HRs and Stand Harvey hit 2 for Howards. Cecil Whitehead also hit a HR. Number 1 ranked Steele’s was knocked into the losers bracket by Maroadi Transfer by a 19-15 score. Steele’s came back through the losers bracket and beat Maroadi in the losers bracket final 26-9. They hit 15 Home Runs in the game, including 6 in a row.